One of the best kept secrets for the fashionable woman is great lingerie. Just as a wise man built his house upon a rock, the wise woman starts her look with great fitting undergarments. Unfortunately, today we tend to over look this area. Generations ago, corsetieres came into homes and gave the lady of the house a custom fitting. 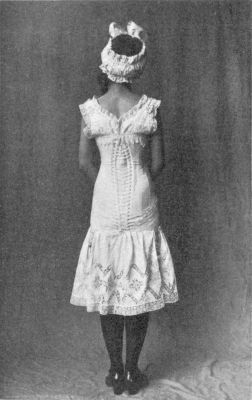 Corsets were not sold in stores. My ancestors were corsetieres in Niagara Falls, Canada. 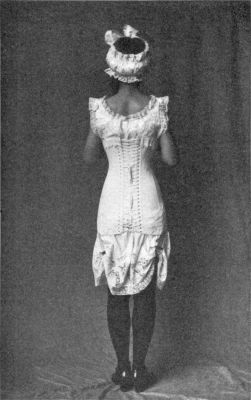 The Spirella Corset Company began in 1904, and would send a female professional into customers homes to fit them for the perfect bone corset. We have it so easy today, don’t we? This is a poorly fit corset. This is a properly fit Spirella. Spirella was making corsets well into the 1960’s. Wonder why women in vintage photos look so grand? Guess what they are wearing underneath? My Grandmother used to say, don’t ever wear undergarments you would be embarrassed to have a doctor see if you got hurt and were sent to the Emergency Room. What a thought process! Since we think that no one really sees our undergarments, they get put on the bottom of our priority list. Did you know that a proper fitting bra can change your figure by as much as 2 inches? It can make you look bigger and fuller, or it can even make you look like you lost weight! Do you wonder why you can’t find blouses to fit? Perhaps it’s time to shop for some new foundations instead of new clothes. I love lingerie. Designing lingerie was my specialty in college and I worked for a lingerie company for a number of years in Chicago. I guess you could say it’s in my blood. Every woman should build her wardrobe from the foundations up. If your “girls” are headed South, it’s time to pick them up and put them back where they belong! How do you know when you need new foundations? 1) Have you gained or lost more than 7 lbs. since you last purchased undergarments? 2) When you look in the mirror (fully clothed), is your bust point centered between your shoulder and elbow? 3) Has it been more than 6 months since you purchased new braziers? 4) Are wearing your bra on the last or smallest hook, and the band is still loose? Are the under wires are protruding into your side? Are your breasts are spilling above or below the bra? Do you feel confident wearing your undergarments, or do you feel frumpy and grumpy? If you have answered YES to any of these questions, it’s time to go shopping! Correct fit is essential. Since we no longer have the option of in home fittings, we need to find a specialty shop dedicated to filling this need. 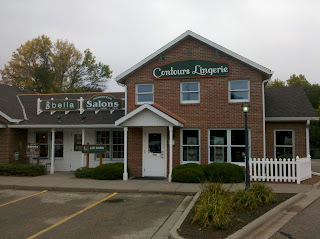 Here in Madison we are blessed with Contours Lingerie at 6102 Mineral Point Road, Madison, WI. Contours is a great place to find a beautiful selection of foundations and specialty sleepwear. Personalized service, and a wide selection of larger sizes adds to the package. Contours specializes in bra fittings (no charge), and has a wonderful selection including European style garments. I stopped in recently for a fitting, and picked up a coupon for a discounted wax at the Bella Beauty Salon next door. You also get a free pantie with a wax! You can’t go wrong with this deal! If your not local, getting a proper fitting can be as close as your local department store. JC Penny’s offers free fittings, plus you get an additional 20% discount on your purchase! Call today! 1) At least one T-shirt Bra, preferably in several colors, such as beige, white and black. Avoid prints and unnecessary wild colors. 2) A Convertible bra, including X and T back styles,usually they come with removable straps for an optional strapless look. 4) An all lace bra, preferably in a great color like red. Step out of your box on this one! 5) A Minimizer Bra, you just never know when you might need it to fit under a certain blouse! 6) Various pantie styles and fabrications including lace, cotton and tricot. Vary the waistbands to include bikini or boy short and high waisted. High waisted pants are coming back, be prepared! 6) Several different styles and colors of Spanx or smooth fitting spandex type undergarments including a camisole, a T-shirt style, and a bottom such as a bike short or full body hugging style for wearing under clingy dresses. 7) You should also own long winter underwear, especially for those of us in cold climates. Try Cuddle Dudds for a warm fleecy type feel, or the lighter weight silks from Land’s End. Do not under any circumstances wear the old fashioned thermals! They are SO unfeminine and will add inches to your figure! Yikes! Who wants that? 8) At least one silky fabric camisole. They fit great under clingy T-shirts and blouses, giving you a smoother look. Always remember to wash your lingerie in a lingerie bag on the gentle cycle. Don’t ever dry them in the dryer. Undergarments will last infinitly longer by air drying them. Two things that are completely passe’ are girdles and slips. Spanx are a hundred times more effective, they don’t ride up, and they are a thousand times more comfortable. Need I say more? In closing, I will share with you one of my favorite stories. We were at a Christian couples weekend when our keynote speaker told us this story. He was shopping at his local Mall, when he noticed a band of Amish ladies MARCHING down the Mall, all of them carrying Victoria’s Secret shopping bags. Just because you look plain on the outside doesn’t mean you can’t look GREAT on the underside! Happy Shopping!